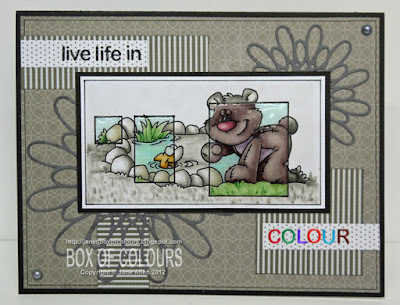 Jane's Box of Colours: Outdoor activities anyone? Over at Dustin Pike's place we are all getting a bit outdoorsy!! If so all you have to do is create a card using one of Dustin's Doodle Dragon images with an outdoor theme, post it on his blog and follow the instructions to get a freebie digi. As you can see I decided to have a bit of fun with my particular image, colouring the small squares and well what do you call the black and white bit - monotonering????? I then added a little Diamond Glaze to sort of make them look like windows and finished off with a couple of Poppy Stamps dies and some peel-offs. Now, do not forget that Dustin is currently celebrating his Blogiversary and is offering some pretty fab deals. WoW! Just Stunning..Fabulous image. FAbulous colouring. LOve it. I love your card, it's very cute! Fabulous card i love the sweet image.Thankyou for joining us this week at CRAFTY CATZ. Oh how cool is that, Jane! Oh......I love this! You've inspired me to want to try the spotlight technique again. I haven't done it in a long time! Great Card! Thank you for joining us at Fussy and Fancy for our Punches and Dies challenge! gorgeous image! Thank you so much for entering our challenge at Stampin for the Weekend and good luck!